Happy Sunday to you … and I hope you are enjoying your Labor Day weekend, and (for some of you) the extra day off work! I’m excited to share with you a cute whimsical card and an amazing promotion to go with it!! Our September promotion is called “Dashing Along” and offers you a FREE 12 x 12 package of this amazing Designer Paper! When creating the exclusive Dashing Along Designer Series Paper, Stampin’ Up! decided to use a mix of old favorites and new patterns to bring you beautiful, traditional Christmas paper. This collection of patterns has an eclectic feel and is perfect for layering, and while the newsprint design isn’t Christmas-themed, we selected it for its versatility and popularity with you, our customers. 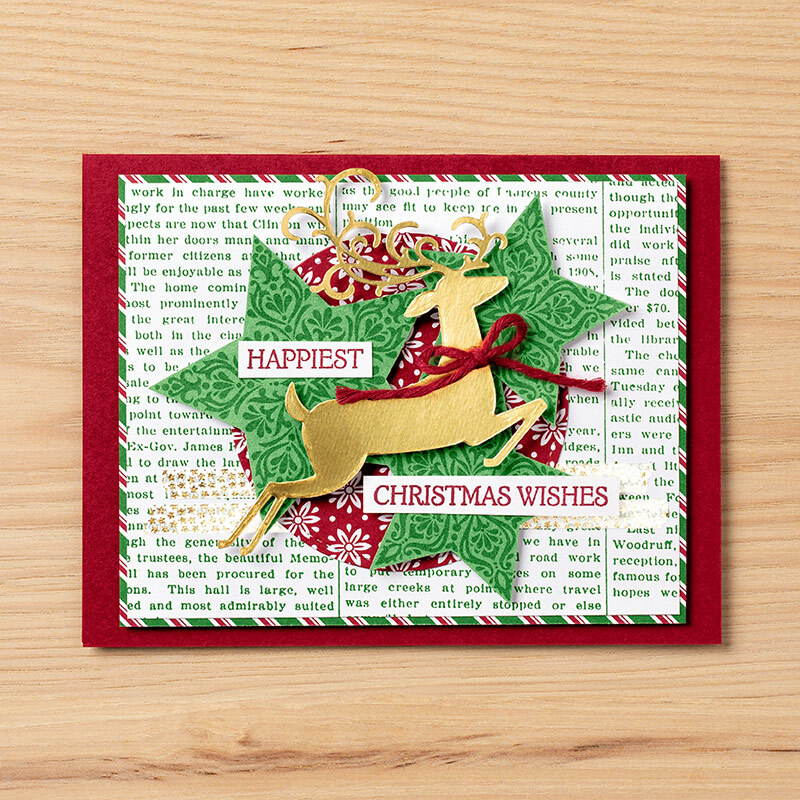 This simple card is easy to create with the Dashing Deer Bundle featured on pages 8 and 9 of the Holiday Catalog and is most definitely highlighted with the Dashing Along Designer paper. September is a great time to host a workshop … first, you could qualify for this great designer paper for FREE plus even more goodies, and you could pick them from the Holiday catalog!! Because the Holiday catalog goes live on the 5th – you could be the first to show all your friends some of the beautiful product suites in the catalog! 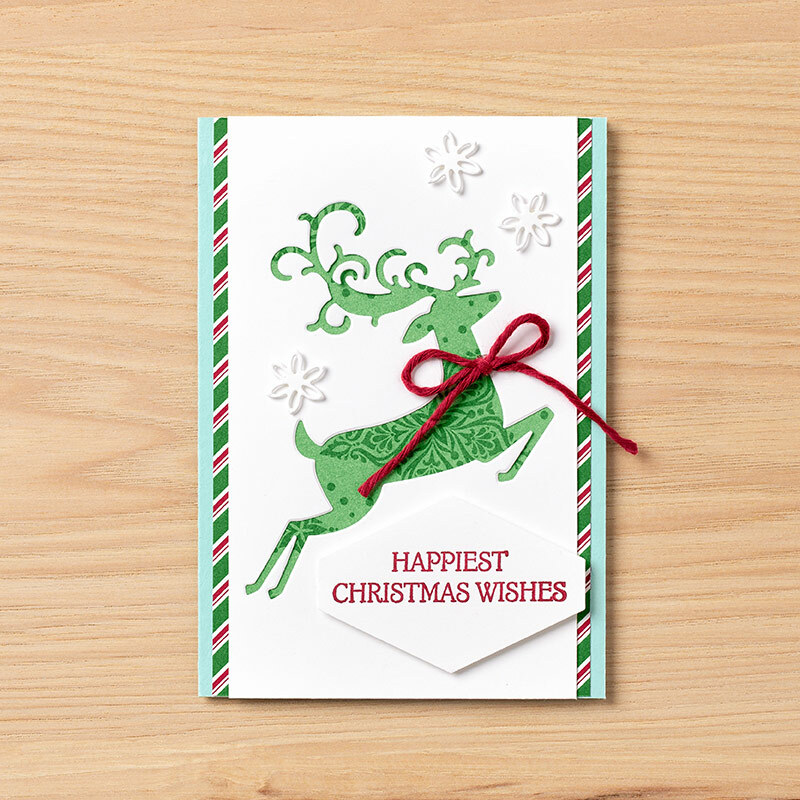 Wow … you can see 3 beautiful designer paper patterns on this card, and there is that beautiful deer again! I can see your friends dashing to the catalog to get a look at this bundle.